I recently completed a large project using Memsource. My tool of choice is SDL Trados Studio 2011 and although I didn’t like having another tool imposed on me by my project manager, I was pleased to have the chance to put Memsource through its paces. Briefly, Memsource is a TEnT (Translation environment tool) that stores all resources (projects, translatable files, translation memories, termbases, etc.) in the cloud. The translation process is completed in a standalone Editor installed on a local machine. I used a “linguist” account, which was the licence that my agency gave me to work on this particular project. My function in the project was to review the translation of 55 files (a total of 60,000 words) done by two translators. I was up and running in no time. All I had to do was download and install the Editor, log on to Memsource Cloud and download the file to be reviewed. I opened the file in the Editor and the TM was automatically activated. Fast file-opening and translation process (although QA and down/uploading take their time) Studio isn’t renowned for its speed. Join and split files. Even “linguists” can decide which files to join and when. Studio can merge and split files, but the feature only works when you create a project. You can’t add files later and merge them. Export to bilingual docx. Identical segments are greyed out, and can be autopropagated when the file is imported back into the Editor. Export for external review has more options (including top-down or side-by-side layout), but identical segments aren’t greyed out. Choice of default quote and apostrophe types in source and target. Curly quotes can be inserted using quick insert tags. Not quite as fast. TM search brings up exact matches only (great! ); wildcards can be used too. Searches inside quotes bring up the exact phrase. Concordance search brings up useful and useless matches. So a search for “vasodilation” returns “solution”. Quotes can’t be used to search for an exact phrase. Subsegment match in TM No direct leverage from subsegment matches, only through fuzzies. Filtering by words in the file is very fast and simple. Filtering is very powerful in Studio but only if you know how to use regex. Segment filtering by 1st repetition (but not by number-only). Lots of filtering options, but not by 1st repetition. Lightning fast technical support for help in general and bug solving in particular. If you don’t have a support agreement you may be left struggling. Spellcheck: Internal is too limited; no real-time spellcheck. Export to docx for Word spellcheck is time-consuming. Wiggly red underlining is a life-saver. Adding to my customised Word dictionary is very useful. Autopropagation only works downwards and not for number-only segments. Options to autopropagate from the top, ask for confirmation, etc. When files are joined, you can’t tell which is which. (Tip: click “preview translation” to see the file) Clear file division and navigation panel within each merged file. White space characters at the end of the line aren’t shown (QA will pick up “invisible” double spaces). Importing of TMs hasn’t been polished yet. A small 90-segment TMX only resulted in 65 segments in Memsource. *See update in my reply below to David’s comment. Non-breaking space is displayed as an ordinary space. *See update in my reply below to David’s comment. For translators who are new to TEnTs, I think Memsource is an excellent option, because it’s simple and fast. The free personal licence (limited to two files at a time and 10 MB file size) is great for investigating how TEnTs work, without any time limit. For project managers, Memsource is also a good option because they can control the whole process, see who is translating what, and when. They can define QA settings, which TM to use and whether to lock segments. For post-editing work Memsource can analyse how much a target segment has been edited after machine translation and rates can be adjusted accordingly. Although I don’t do post-editing work, this is clearly an innovative alternative to charging by the hour. For small teams Memsource also has great potential. Translators can share resources in real time. But personally, I don’t like having my hands tied. As a “linguist” in a Memsource project I can’t upload translation memories or termbases (so I can’t make use of my own resources) and I can’t lock segments. As a freelance user of Memsource, I’d like to be able to have more say in how to use the features: I’d like to choose the way tags are displayed or decide to omit a tag (without it being autocompleted on the server when the file is generated); I’d also like to decide if and when to autopropagate segments. And I miss regex. That said, Memsource has only been on the market for about 18 months and it’s growing fast, having just reached the 3000 user mark. I’m sure that many of the drawbacks listed in the table above will be solved soon. The developers are good listeners and they provided great support during the course of my project, so I look forward to reading about new features when they appear. In the meantime, it’s back to Studio for me. This entry was posted in 2. 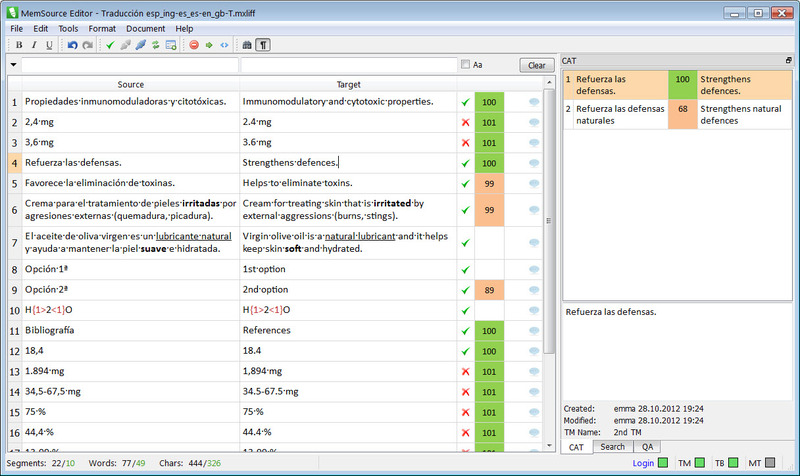 Beyond the Basics, SDL Trados Studio and tagged CAT comparison, MemSource, SDL, Studio, Trados. Bookmark the permalink. Thanks for a great post that very well captures the differences between Studio and MemSource Editor. Just a minor note: MemSource TMX import works without any problems I think. It may be that your TMX file included some duplicate segments and we do not import these. I’ve downloaded the latest build (1.71) and it’s great to see that non-breaking spaces are now displayed properly. Also, I’ve tested several more TMX imports using MemSource Cloud and can confirm that all the segments have been imported in all of them. Having used this tool once on a fairly large project, I feel that the new post-analysis feature in MemSource will open the door to a debate on MT in post-analysis in the future. Should MT be included in post analysis? If so, should MT leverage be discounted according to a traditional repetition discount structure? I set out to put these thoughts into a comment to this article but my rant eventually evolved into a stand-alone guest posting entitled “Thoughts on Machine Translation and Post-Editing Analysis“. Dear Emma, I read this blog post right after having tested MemSource Cloud/Editor for the first time. My impression of the tool was ‘wow’ – I did not expect it to be that simply well done and easy to use. It does look a lot (and sounds a lot) like memoQ (my tool of choice), but I was amazed at how simplicity can be powerful. Also, your analysis hits the spot. Thank you also for some of the insights I overlooked. – White space characters are still not displayed at the end of the line. I got caught out several times adding a space and then finding double spaces when I proofread the target file in Word. – Still no spellcheck on-the-fly. This is a show-stopper for me. I need to see that wiggly red line. – Autopropagation is still not applied to the whole file, only from the active segment downwards. – Filtering for one word in the source and another word in the target at the same time. I found that really useful (and Studio doesn’t do that). Thanks for the heads-up. I thought that MemSource Editor upgraded itself automatically but it seems this isn’t the case. I’ve now downloaded version 3.89 and am happy to see white space characters at the end of lines! Is there a list somewhere of the other improvements you’ve made with this release? Some of them are based on your feedback – thanks. The next goal for us is to completely redesign and improve the spell-checking functionality in MemSource Editor. Inline spell-checking will be part of that. I hope we can have something ready late April/May. Many thanks for the heads up about the new spellchecker and on-the-fly alerts for spelling mistakes. Excellent news. Great article. I’m a project manager who uses both MemSource and Studio 11. For managing projects, I certainly think MemSource is the easier of the two. It’s currently lacking features that would be nice to have but for me, they’re not make or break features. We have a lot of translators who are reluctant to switch to MemSource but sometimes the project calls for it. Only a small handful of them came back and told us they didn’t want to use it again. I enjoyed reading your reasoning and reaction to the system. One thing I’d like to point out. While MemSource Editor doesn’t allow for you to have multiple files open at a time, you could use the web editor if the project manager has enabled it. Do you know how to logout from Memsource Cloud? There’s a sign out button in the top righthand corner of Memsource Cloud. If that’s not what you’re looking for, MemSource has an excellent forum under their Support tab http://support.memsource.com/ where the developers will answer your questions immediately.